Let's step back into conference, shall we? 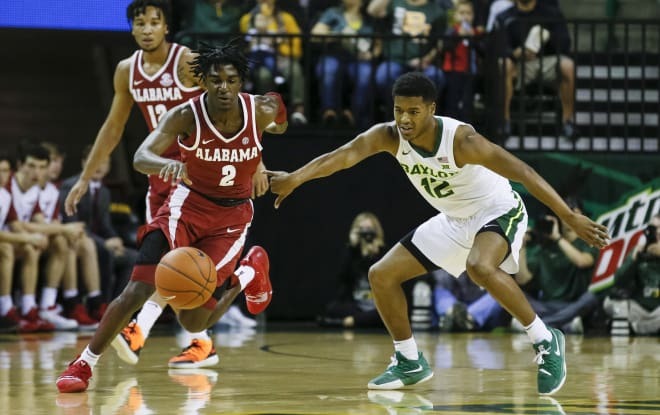 Following a hard-fought loss in Waco to Baylor, Alabama (12-7, 3-3) will seek to get back on track on Tuesday night when they host Mississippi State (AP: 22; KenPom: 29; NET: 29). The Bulldogs enter this game with a 15-4 (3-3) record. Game time is 7:30 P.M. CT. The game will be televised on SEC Network. Due to inclement weather, there is a possibility that the game will be rescheduled so please keep that in mind if you are planning to attend. And if you do decide to brave the weather, please use caution. My Two Cents: I don't have much to say about the Baylor game. It was a road game vs a tough, well-coached Big 12 team. Our guys had chances to swing the game in their favor, but both teams played hard and only one team can win. I didn't come out of that game feeling any less different about Alabama than I felt going in. I still believe this team is trending in a positive direction. Mississippi State enters this game winners in three of their last four games. The Bulldogs are rated high at KenPom on the offensive end, ranking top 50 in three categories: Effective FG % (35), Offensive Rebound % (24) and 3-point % (43); and top 100 in another three: 2-point % (79), Free Throw % (53), and steal % (54). Their total adjusted offensive efficiency at KenPom ranks them in the top 20. Defensively, the Bulldogs are not as highly rated, but their numbers are still solid. Where they really shine on the defensive end is using their length to be disruptive in the paint and in the passing lanes. Opponents are only making 47.5% of their 2-point attempts, and the Bulldogs rate very high in block % (14.3) and steal % (11.2). Alabama had a field day scoring in the paint against a smaller Baylor team, but will have to add more of a perimeter punch in this one. Opponents are shooting the 3-point shot well against the Bulldogs (35.4%) so hopefully our guys can have a better than average (34.4) day. It seems like a broken record, but keep an eye on the rebounding stats and free throw attempts. Alabama's greatest strength this season has been rebounding, and limiting their opponents second chance opportunities. They failed in that regard this past Saturday, and it was a key reason why they lost the game. As good of an offensive team as Mississippi State has been, if Alabama allows them second chances at the basket I don't think they have a chance to win this game. State doesn't get to the free throw line much (ranked 263 in free throw rate), while Alabama is top 50 in free throw rate (32). If that type of discrepancy is reflected in Tuesday night's box score, Alabama's chances of winning should be good (assuming they can make their free throws). As I mentioned earlier, Alabama needs to have a good night from the 3-point line because State does a good job of limiting easy looks in the paint. Players to Watch: Riley Norris must like Texas. His best two games came in the state vs Baylor and Stephen F. Austin. Can he put together a great performance outside of the Lonestar State? And, yes, I understand that Riley does a lot of things that aren't always reflected in the box score. However, with no clear cut star, and with the team in need of a more consistent performer on the perimeter, the senior from Albertville is more than capable of filling a more substantial role for this team as his college career nears its conclusion. This will be one of the bigger teams that Alabama has faced. State has three players in their rotation that are 6-10 or bigger. Aric Holman is a 6'10, 225 lb senior. Currently projected as a first round draft pick, Holman is an inside/outside threat. While his 6'10 frame allows him the option to score around the rim, he's also second on the team in 3-pt pct at 42.1%. He could be a matchup problem on Tuesday night. He's averaging 11.4 ppg, 7.6 rpg, 2.3 bpg, and 1.1 spg. Reggie Perry is a 6'10, 245 lb freshman forward with a tremendous upside. A very physical player, he's gotten better as the season has progressed. He's currently averaging 7.3 ppg and 5.9 rpg. I don't know what Perry's plans are beyond this season, but if he returns to Starkville next season, expect him to be a breakout candidate. The third big man for this team is Abdul Ado, a 6'11, 255 lb sophomore. Like Perry, Ado is a very physical player. He's averaging 5.3 ppg, 4.9 rpg, and 1.8 bpg. Ado has made strides in his two seasons so far, and I suspect he will continue to develop over the course of the next two seasons. He's more of a role player right now, but capable of impacting a game with his size and physicality. Prediction: I don't like this matchup for Alabama. The struggles on defense have improved, but the team did have a lull on Saturday where Baylor got too many easy looks in the paint. Bama did a better job guarding the dribble drive, but I think it could be argued that Baylor's guards are not elite athletes. That obviously won't be the case on Tuesday with guys like Lamar Peters and the Weatherspoon brothers. For Alabama to win this game, they're going to need to out-rebound a bigger, more physical team, I believe they're going to need to shoot the 3 very well, and I believe they'll need to get to the free throw line often and make their shots there. They're capable of doing that, but I just don't like the matchup in this one.